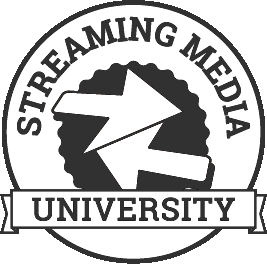 Description: This course helps those new to streaming media get familiar with the relevant terms, concepts, and technologies. The session begins with a definition of terms like codecs, container formats, and adaptive bitrate streaming, as well as encoding concepts like bitrate control (VBR, CBR) and frame types (I, B, and P). Then it details the key H.264 encoding parameters that impact quality and compatibility. Next up is adaptive streaming, including a review of available ABR technologies like HLS and DASH, how to formulate an encoding ladder, and how to use multiple DRMs to protect premium content. Then we'll review the technical requirements for ABR delivery to computers, smartphones and tablets, OTT devices, and smart TVs, and finish with a quick look at advanced codecs like HEVC, VP9, AV1, and VVC. You walk away knowing the technical requirements for delivering to all key platforms and an understanding of how to do so. Description: This workshop teaches you how to use and configure the essential (and purposely redundant) components of a live streaming event system. Demonstrations feature hardware from various vendors, including cameras, H.264 encoders/streamers, video switchers, video signal conversion, recorders, and more. You also learn how to best deploy the live stream to your audience based on business requirements: Do you utilize free social media outlets, work with a premium third-party streaming service, or build your own live streaming infrastructure? Learn how to approach different live scenarios with the right gear to fit the budget you have. And perhaps more importantly, learn how to properly formulate a budget to avoid any common pitfalls in the process. Description: The concept of a single set of files deliverable to all relevant endpoints has been the Holy Grail since the dawn of ABR streaming. By mid- 2019, the Common Media Application Format (CMAF) will enable such a solution, slashing encoding, storage, and bandwidth costs for companies who deploy it. In this workshop, you learn how to create CMAF packaged assets for HLS and or DASH and get a greater understanding of the benefits CMAF has to offer. We start at the industry baseline of H.264-based CMAF content, then offer insight and direction on how to handle more complex and emerging solutions. We briefly cover how to extend what you learned to alternate codecs starting with VP9, then to 4K encoding, packaging, and delivery with HEVC or AV1. We also touch on some of the considerations and challenges with HDR encoding and delivery. Last but not least, we cover the details and “how-to” knowledge to protect your CMAF content with DRM, including what you need to know about CENC, CBCS, CTR, and working toward truly fulfilling the vision for unified common encryption DRM on the horizon. Description: Encoding workflows for nearly every video ecosystem can utilize powerful and free open source options, such as FFmpeg, which appeal to startups and established businesses for the flexibility in customization that it offers. This presentation explores extended encoding options for FFmpeg including libx264 (AVC/H.264) and libx265 (HEVC/H.265) to maximize compatibility with a wide range of mobile and desktop browsers, as well as streaming media servers. Learn how to use filter effects, proportional crop/resize options, and mapping functions. Harness the power of FFmpeg in your next encoding pipeline upgrade! Description: Machine learning as a service (MLaaS) is a subset of artificial intelligence (AI) and has come a long way over the last couple years. Now is the time to really make these services work for you and increase the ROI on your media. Whether you want to enhance your video searchability and discoverability, automate the process of generating transcripts and translations, or even look for specific faces or people within your live surveillance streams in an efficient manner, the key to harnessing this power is to learn to determine your needs and code against the numerous available MLaaS APIs to make them work for you. This workshop reviews the 2019 MLaaS landscape, explores the use cases that drive their innovation, and discuss various resources and open source code at your disposal. Attendees walk away with an understanding of how to harness the power of AI machine learning to increase the ROI of their video libraries and build compelling and innovative intelligence from their libraries of dark media data. Description: Mix and mingle while enjoying drinks and tasty bites. Our VIP Mixer is a great opportunity to meet new people, share experiences, and learn from each other in a casual, relaxed atmosphere. Open to all full-conference attendees, speakers, and vendors. Description: The definition of TV has fundamentally changed, with cord cutting rising to 33 million adults in 2018 and experiences becoming even more personalized for viewers. Hulu sits at the center of this shift and has experienced a massive amount of growth and change in the past year. With more subscribers than the largest U.S. cable and satellite providers (25 million and counting! ), the company needed to further personalize and strengthen its viewer experience while scaling its business and service to account for this rapid growth. In this keynote, Hulu CTO Dan Phillips reflects on his first year at the company and discusses what’s on the horizon for the streaming giant. Description: Chris Allen, CEO and technical Co-Founder of Red5 Pro will talk about the new and emerging use cases for real-time, live broadcasts capable of scaling to a massive audience. He will explain why efforts to improve HTTP based protocols are essentially futile, and that the future of live broadcasts will not be measured in seconds, but in milliseconds. Chris is going to dispel the myth that WebRTC can’t scale, and show how Red5 Pro customers are currently changing what’s possible with live broadcasting. Description: Study after study shows increased viewing for all OTT services on the TV screen, not just SVOD services. In fact, ad-supported services are growing in number, leading to an increase in connected TV ad inventory. If you’re an ad buyer, how do you take advantage of this growing source of addressable ad inventory? If you’re a provider with inventory, how do you connect with the buyers? What are the issues with connected TV advertising, and how are they being addressed? Join this panel representing both the supply and demand sides, as well as content services and platforms, for answers. Description: Have you been dating just one CDN for what feels like forever? While monogamy may be good for personal relationships, it can create a lot of risk when it comes to streaming media delivery. As CDN delivery continues to become more commoditized, working through the solution to have an intelligent multi-CDN solution in place is critical for widespread critical delivery at scale. This session dives into the options, providers, and solutions and examines how and what to consider. It also shares some of the “gotchas” around security and implementation that need to be accounted for in the client and infrastructure, as well as how to take it to the next level with advanced concepts. OTT101: 2019—The Year of Direct-to- Consumer Video Services? Description: As Disney, WarnerMedia, Apple, and NBCUniversal prepare to launch direct-to-consumer (DTC) services—joining existing ventures like ESPN+, CBS All Access, and DC Universe—will existing SVOD and live-linear services like Netflix, Hulu, and Amazon Prime be able to compete? Or will the DTC offerings falter against the incumbents? This session examines the pros and cons of DTC services and evaluates the likelihood of success in the crowded OTT landscape. Description: Hardware codecs in FFmpeg like those from Intel and NVIDIA deliver significant performance gains over x264/x265, but have a reputation for lower quality and use a completely different command set. This session benchmarks the performance and quality of these codecs and detail the FFmpeg command syntax. Attendees learn when and how to use these hardware codecs in your VOD and live encoding workflows. Description: It is unacceptable for online video to start buffering right before a game-winning play or an award winner is announced. The demands on OTT providers are increasing with the demand for live video. Having a robust content delivery network as the backbone of your streaming infrastructure is key. This group of providers and end users discusses delivery at scale to ensure consistent stream quality, which keeps the viewers happy and the valuable ad dollars safe. B102: How Are AI & Machine Learning Impacting Streaming Video? Description: With the right media architecture, viewers and content producers alike can save time on content discovery. Automating the discovery process frees up viewers to spend more time consuming, and it gives producers more time to create content for those viewers to find. This panel examines the business decisions and impacts of AI to streaming applications; the ways in which consumers will get content faster, more seamlessly, and without extensive searching; and the technical requirements to build smarter, AI-powered streaming applications. Description: With the “end of Flash” just around the corner in 2020, you need to be using common standards to reach all of your target audiences. For those who deliver live video within a web browser, HTML5 has had plenty of time to play catch-up and surpass Flash capabilities— or has it? In this session, learn which transport technologies (or combination thereof) from HTTP, WebRTC, RTSP, and even RTMP work best, when to use them, and where to put your development dollars for maximum return. Description: As online video services and, increasingly, cable and broadcast operators work to build competitive streaming offers, understanding consumer interests is key: What content do they want to watch? What features are important? What devices do they use? How much are they willing to pay? And how do these behaviors and priorities vary by consumer segment? This session explores findings from Altman Vilandrie & Co.’s annual consumer video survey, including consumer preferences for specific programs, interest in live news and sports, monetizing OTT, and other areas of critical importance to our industry. It includes a panel discussion featuring top executives from the TV industry. Description: CMAF is a format that can create one set of media files deliverable via DASH and HLS (and other ABR formats), potentially saving big dollars for encoding, packaging, storage, and delivery. Decoupling manifests from the media segment formats and being able to deliver the same media segments anywhere is a huge win. With DRM encryption requirements on the rise as well, CMAF offers the best path forward for reach and capability while reducing the formats and versions necessary to hit every platform. Attendees leave knowing the pros and cons of CMAF and with a high-level road map for deploying it. Description: Behind every successful live stream is a team of experts troubleshooting issues and, ideally, anticipating problems before they even begin. From the producer managing the team to the audio engineer mixing for the audience, every role is key to the success of the show. This session features panelists representing key roles in a control room. Live streaming demands a special set of skills that can save even the biggest budget broadcast. This team takes you through steps to make your next live production a success. Description: Latency is a major challenge for the online video industry. To tackle it, many video providers have taken steps to optimise their live streaming workflows and provide near real-time streaming experiences for end users, resulting in more engaged audiences. This session will present the latest advances in Common Media Application Format (CMAF), particularly around Low Latency, or LL-CMAF explain how it can be used as part of a standardised transport container using MPEG-DASH and HLS, and present some of the main reasons for its adoption. Attend this session for your chance to win: The first 50 attendees will receive a Bitmovin notebook. Description: Today’s consumers are interested in being targeted in different ways with authentic, relevant, and creative content. Through the implementation of universal ID for connected TV, in conjunction with unified IDs on desktops and devices, marketers can optimize the user’s personal ad experience. Dailymotion’s VP of global programmatic and strategic partnerships, Nola Solomon, examines the benefits of creating a unified ID across devices for an omni-channel approach that allows marketers to optimize the viewer experience, as well as how this enables marketers and advertisers to continue to share consistent, relevant messaging across various platforms and devices in real time. Description: Per-title encoding techniques customize the encoding ladder to match the encoding complexity of the source, saving bandwidth on easy-to-compress videos and ensuring the quality of more complex footage. Codec specialist Jan Ozer compares the efficiency, implementation issues, and costs of multiple commercially available and open-source alternatives for live and VOD per-title encoding. Learn what per-title encoding is, how the various options work, and which is the best option for you. Description: What do you want to do with your data? For too long, data has been framed as a means to some end—collect data, compute analytics, interpret, then react. Today, we propose a new mentality: data as an end in itself. Join our panel as we dive deep into the questions video distributors need to ask in order to build a real-time feedback loop to guide their distribution strategies: How does data latency influence its usefulness? How can normalized data unite disjointed datasets and systems? What are some examples of automated processes already employed by companies today, and what kind of data infrastructure will it take to develop more automated processes within the video technology stack going forward? Description: Machine learning as a service (MLaaS), a subset of artificial intelligence (AI), has come a long way over the last couple years. Now is the time to really make MLaaS work for you and enhance your media discoverability and insights. These enhancements can range from video searchability and discoverability, automating transcript and translation generation, or even pinpointing specific faces or people within your live surveillance streams in an efficient manner. The key to harnessing this power is to learn to determine your needs and code against the numerous ML service APIs that are out there to make them work for you. Attendees walk away with an understanding of how to harness the power of AI machine learning to increase the ROI of their video libraries and build some compelling and innovative intelligence from their libraries of dark media data. Description: Every social platform has its own best practices for boosting and monetizing your content. With all of these different rules, it can be difficult to know which tips help and which tricks hurt. Targeted native and branded content advertising are standard for premium channels, but creative producers are exploiting the advantages of social platforms to create new income sources. These panelists share their successes and discuss the tools needed for monetizing in the social realm. Title: Low-Latency CMAF: The Next Big Thing in Live Streaming? Description: YouTube ranks as the second largest search engine in the world, and more than 1.9 billion people use Facebook Live monthly. Companies that aren’t incorporating live video into their marketing strategies are missing out on valuable customers. In today’s mobile-first world, live video serves as a way to connect directly and instantly with the followers you have acquired on your social channels. In this session, attendees learn how to increase the ROI of live video through identifying a single call to action, advertising your live event, showing off your product/services, and interacting with those who tune in. Description: A good packaging strategy can bring numerous key benefits to your operational flexibility. This session asks panelists to talk about their own packaging challenges and strategies and looks at how the emergence of dynamic packaging can provide significant operational cost savings as well as higher levels of security and flexibility as audiences evolve and change. Description: The joint BBC/ITV venture BritBox appeals to Anglophiles in the U.S. and Canada with a deep catalog of British television content. In this case study, BritBox shares the secrets of its success, including achieving the right size for profitability and meaningful reach, building strong brand identity and a sense of community, careful curation, and using sophisticated discovery algorithms to keep viewers tuned in and prevent churn. Description: The next great codec battle will be between the Alliance Open Media’s AV1 codec and MPEG’s Versatile Video Coding (VVC) technology. In this talk, Bitmovin codec engineer Christian Feldman discusses the coding tools and performance of both codecs, and the lessons that he’s learned implementing AV1 in Bitmovin’s encoding stack for cloud and on-premise deployment. Learn the pros and cons of both codecs in this 45-minute technical dive. Description: Low latency is moving the needle for live interactivity. With the growth of live gaming and polling there is a greater need for a fast, reliable connection, and many companies are taking on the task of delivering it for their clients. With a growing market, how are they using this friendly competition to spur innovation? Come hear how low-latency video transport leaders are shaping the landscape for the interactivity of tomorrow. The future of live is here, now. Description: Session details to be announced. Check back soon! Description: Ultra-low latency for Live is the most important challenge that ABR streaming faces, as it spoils the experience. Poor experience happens through notifications during sport events, or when you have friends watching at a different location. Today we are moving toward 5-8 seconds latency. Here is how we go sub second at scale.Attend this session for your chance to win: THEO Technologies notebooks for all audience members. Description: Advertising has reached a tipping point. According to eMarketer, over 25% of U.S. consumers access the internet with an ad blocker installed. Although personalization has become king in today’s world, consumers still suffer through irrelevant ads. In the absence of a truly interactive ad experience, has our industry pushed consumers to ad fatigue and future abandonment altogether? How can marketers recapture the attention of audiences? Brian Benedik, VP, Global Head of Sales at Spotify, shares best practices marketers should implement to keep consumers captivated and drive business. Description: Check back soon for details! Description: While H.264 has dominated the last decade of streaming, the market is moving toward a new generation of codecs like VP9, HEVC, AV1, and VVC—as well as proprietary codecs—that offer significantly better compression but much more fragmented support in browsers and devices. This roundtable discusses how savvy businesses can migrate to the new technology and get the benefits of more efficient compression without sacrificing audiences. Description: Get up-to-speed on the latest OTT platforms and enabling technologies. Details announced soon! Description: Companies on the cutting edge of video engineering and development share the latest technologies that are pushing the industry forward. Details announced soon! Description: According to Wainhouse Research, a survey of 1,801 executives showed a majority inside the government (67%) had anticipated spending on streaming technology. As use expands, though, are you fully leveraging the technology to deliver accessible, discoverable content while navigating security concerns? IBM Watson Media discusses addressing this through AI-driven video. Description: Eric Harris, the president and chief operating officer at Cheddar, will share his experiences as an early employee at BuzzFeed and Cheddar, the bets they made and are making today, the growth of OTT skinny bundles, and the role of live business and headline news. Description: As packages such as T-Mobile’s “Binge On” enable unlimited streaming of services such as Netflix and Amazon Prime Video to wireless customers, the value to the streaming industry of bringing those same relationships to cable broadband providers is becoming evident. “Traffic exclusion” partnerships, in which selected streaming services are not counted against cable bandwidth consumption, offer a variety of advantages, including access to cable/telecom’s vast service footprint, potential gains in viewership, and the ability to drive viewership through co-marketing opportunities between streaming video and cable/telecom providers. Description: Having the right tools for the job allows you to work smarter, not just harder. Developing for and supporting some of the biggest live streaming events such as the Super Bowl, Olympics, and the World Cup require beefing up and refining the arsenal of tools we bring. This session covers must-have tools for monitoring, debugging, identifying, and solving problems quickly and effectively for live and on-demand streaming content. The tools include freeware, opensource solutions, paid products, and some custom tools RealEyes will share with the community. We discuss some of the gotchas and key issues to look for when dealing with major events—how to spot them and what to do on-the-fly when you have only one shot to get it right. Scott Apgar, Senior Director of Product Management and Advanced Advertising, SeaChange International, Inc. Description: Since nearly the beginning of television broadcast, the linear dynamic ad insertion (DAI) business model has remained fairly unchanged. This ad sales model is an inefficient and operationally expensive process, with many manual steps and room for mistakes. The quickly transitioning OTT ad insertion model is fully targeted, happens dynamically at the time of viewership and can be measured directly and accurately. So, why aren’t we seeing faster adoption of the new OTT dynamic ad insertion model in the video space, and why are people hanging on to the linear broadcast model? Description: During this session, CBSSports Digital will share how they deliver high-quality live streamed sports coverage to viewers by building an architecture that scales for growing audiences, exacting performance requirements, and increasing redundancy. Title: Comparing Revenue Strategies for OTT - Which One Works For You? Description: Learn about different revenue strategies for OTT publishers. See which monetization opportunities have been trending and compare use cases. Explore and evaluate which revenue model works best for your business. Attend this session for your chance to win: $10,000 ConnectedTV Ad Campaign: Run your TV Commercials across hundreds of Roku, FireTV and AppleTV Channels to capture new viewers, customers and donors. Description: Education video usage both inside and outside the classroom is on the rise. The process of creating, managing, and delivering live and on-demand content continues to evolve. What technologies and best practices are schools using? This session explores successful workflows schools have developed to simplify video adoption and make the technology more transparent to educators and students. Our education panelists also recommend crawl-walk-run implementation steps and share lessons learned. Description: Open source tools like FFmpeg and Bento4 are used to build massive encoding farms for high-profile premium content services, but they also serve wonderfully as simple tools for smaller developers and can deliver significant functionality with minimal programming. If you can write a batch file on Windows and have access to a Linux box, you can learn to encode and package an encoding ladder to HLS/DASH with captions and encryption and to set up a simple watch folder for drag-and-drop operation. Description: Server-side ad insertion (SSAI) is a pivotal technology that unifies ad serving in broadcast and digital, as well as offers greater targeting capabilities. It makes OTT feel more like TV, it combats ad blockers, and it allows engineering to create a standardized server-side architecture to replace the older, unique client-side architecture used for each and every endpoint. A number of challenges exist, from measuring audience surges to aggregating reporting across all devices. This panel reports from the SSAI trenches, discussing these issues as well as exactly what you need to know about using SSAI to successfully deliver personalized advertisement at scale. Description: Developing a video player is no small task. Many different technologies and specifications must come together to create an accessible and cohesive experience. When you are a small team this can feel overwhelming, especially if the player requires custom functionality. In this talk we will walk through getting a core video experience up and running quickly. Then we dive into making our player unique and adding additional functionality such as closed captions and HLS streaming. All the libraries being used are open source, and include React, Video.js, vtt.js, and hls.js. Description: Learn how to leverage the talent and the following of a social streamer. Whether going live on their own channel or promoting a product for an agency, social streamers are their own brand and voice. The eyes they bring from their accounts are an immediate return on your ad dollars. Knowing how an influencer aligns with your message is important. This panel of social and marketing professionals teaches you how to choose the best voice for your live stream. Description: Consumer expectations for their video services have never been higher. Content owners and aggregators, whether operating a traditional video or streaming platform, must have the capability to deliver a personalized and relevant experience. This presentation will show how Synamedia helps our customers process, secure, and deliver premium experiences to any screen, any time, with a flexible UX for a compelling entertainment experience. Description: The challenges of monetizing and delivering video across platforms is not germane to content providers alone: aggregators, global operators, and advertisers face similar questions. The session will address these challenges from all sides: as a content provider, operator and advertiser. Topics include how to leverage automation & self-service to increase efficiency; the simplification of workflows; using system data to provide better insights; deploying modular approaches and how to build advertising-based and other business models around on-demand, live video and streaming channels. Description: To date, most corporate implementations of streaming media in the enterprise have focused on corporate communications and training. Now, organizations are starting to use streaming media in customerfacing environments and in revenue-generating opportunities, and this will be the next breakthrough in streaming media in the enterprise and education. This can’t-miss session gets you thinking about ways to take your streaming implementation to the next level with real-world scenarios of how streaming media has been used to improve customer service, gain new customers, and provide additional services. Description: The NOAA Office of Ocean Exploration and Research is the United States’ only federal organization dedicated to exploring the global ocean. Our main research ship, the Okeanos Explorer, live-streams its deep-sea explorations via satellite for scientists and the general public to participate in our explorations of the unknown. Learn how the NOAA is dealing with low-latency live streaming in a post-Flash world, and how it delivers its streams to YouTube Live. Description: Even companies that are not yet actively operating on a microservices architecture are looking for vendors who at least have a strategy to cater to it for the future. This session examines the core benefits (including redundancy, dev ops, scalability, and self-healing), the different approaches (including containerization and orchestration via Docker, Kubernetes, and Mesos, as well as native microservices models like Erlang), and the complexities of migrating a generic architecture to a microservices architecture. Description: The details and scope of analytics can be daunting and unexplored for many online video deployments. In this session, learn how to gather critical audience participation data from your live webcasts. Both open source and commercial services are explored and demonstrated. Description: Does your client have a limited budget for an on-location show? It is now easier than ever to take the feed and switch it in your home studio. This means no travel time wasted and no flights expensed. The increase of video over IP is allowing for more streaming control rooms to be offsite. Big companies have been using remote systems for years, but now these technologies are attainable on a streaming scale. Learn how to make live streaming easier and more costeffective, by leveraging today’s remote solutions. DT203: Discovery Track Session: Harmonic, SeaChange International, Inc. Description: Launching and operating linear and on demand channels is significantly easier with the arrival cloud solutions for video delivery. For content distribution, broadcast, OTT, VOD or a combination, cloud technologies let you jump on new market opportunities and allow you to monetize your content with dynamic and targeted ad insertion. Attend this session for your change to win: DJI Osmo 2 Mobile Handheld Smartphone Gimbal Stabilizer Videographer Bundle with Case, Flex Tripod, Base and Lens Maintenance Kit ($150 value). Description: Although the Linear Ad Insertion Sales model is well understood in industry today, the approach for OTT is different and requires Ad Sales teams to ramp up on different techniques and tools. Using a segmented targeting approach to Linear OTT DAI while keeping the same Ad Sales model for your teams is possible and doesn’t require new tools. Join Scott Apgar as he discusses a case of SeaChange’s approach to Ad Sales for the Linear OTT DAI offerings, using existing tools and Ad Sales techniques while allowing a flexible, segmented targeting approach. Attend this session for your chance to win: Potensic T25 GPS Drone: FPV RC drone with camera, 1080P HD, WiFi, live video, dual GPS, return home, quadcopter with adjustable wide-angle camera, follow me, altitude hold, long control range ($166 value). Description: As video streaming has grown, so too has piracy. Industry sources estimate that as many as 10% of broadband subscribers pirate live streams through technologies like Kodi boxes that are sold online from countries where it is difficult to litigate or police copyright violations. So how can you protect live-streaming content? This session explores various methods and technologies in use by some of today’s biggest streaming companies to mitigate stream piracy and protect live content. Description: The era of black boxes and closed software is over; operating a streaming video service in 2019 requires a modular video workflow. This is more than moving video operations to the cloud, as services must optimize for the broadest coverage on the widest range of devices, which means using the latest codecs, packaging, and DRM technologies. Codec SDKs, microservices, and docker containers are now critical components of the modern video workflow. Attendees hear what Microsoft and Beamr are doing to facilitate and accelerate modular video workflows that are ideally suited for video encoding, processing, and packaging functionality to facilitate scalability in any video service. Description: The growth of OTT has created opportunities for distributors and marketers seeking to extend their audience reach. What do we know about OTT audiences and the various ways consumers are connecting with the content across platforms and devices? In this session, Marissa McArdle, VP of Product Leadership at Nielsen will share data on OTT viewing patterns and discuss recent advancements in cross-platform ad measurement that has given brands new insights into connecting audiences beyond the screen. Description: HLS and MPEG-DASH are the current standards for HTTP-based live streaming, but these designs are inherently slow and add delays to live feeds. Sub-second latency is critical for scenarios such as gambling, auctions, interactive communications, VR, sports, and gaming. WebRTC is touted for its sub-second latency but couldn’t scale to the volume needed by CDNs and couldn’t reach Apple devices. In this session, learn about a novel WebRTC-based solution that would match current CDNs in terms of reach (all devices), quality, cost, and scale, while providing sub-500 milliseconds latency. Description: You can teach an old dog new tricks. Many producers are putting a fresh face on traditional shows, and major platforms have released players that support 360° video and spurred its resurgence. Gaming tournaments now happen in completely virtual environments. Augmented reality is an opportunity for the audience to see the unexpected and heighten their experience. With 360°, virtual reality, and augmented reality, the viewers are a part of a new story that they help create. Find out how building a stream with these elements can increase viewership and extend view time. Description: Looking to experiment with non-linear storytelling, Netflix launched its first interactive episodes in 2017 with two children's adventures that encouraged even the youngest of viewers to control the trajectory of the story. “Bandersnatch" took interactive storytelling to another level with complex interactions, seamless segment transitions, and states that allow early decisions to impact the story much later. This presentation delves into how we overcame some of the more interesting technical challenges of the project (i.e., mastering, encoding, streaming), how we utilized SMPTE IMF to streamline the process, and why we need more formalized mastering practices f o r future projects.